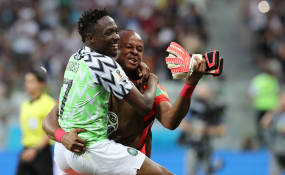 Super Eagles captain, Ahmed Musa bemused by two disallowed goals in Saturday's Africa Cup of Nations qualifiers against South Africa in Johannesburg, has called on the Confederation of Africa Football examine the goals. South Africa came from behind to hold Nigeria to 1-1 draw, a result which earned the Super Eagles the right to return to the AFCON tournament after missing the 2015 and 2017 editions. But Musa felt that the Super Eagles deserve to win the game. He had put Kelechi Iheanacho through but Bakary Gassama from Gambia rule the strike offside. Later in the second half Musa again was through on goal, but he was whistled off-side replays of both actions clearly indicated that the referee erred. Musa made his feeling known on social media with a tweet on CAF Twitter handle: "Offside @CAF_Online."